Under this name “yellow vests”, a titan barely wakes up, still groggy from the coma in which he was plunged for more than forty years. This colossus no longer knows his name, no longer remembers his glorious history, and no longer knows the world where he’s opening his eyes. Yet, as he reactivates itself, he discovers the magnitude of his own power. Words are whispered to him by false friends, jailers of his dreams. He repeats them: “French”, “people”, and “citizen”! But by pronouncing them, the images that come back confusingly from the depths of his memory sow a doubt in his mind. These words have been used in the gutters of misery, on barricades, on battlefields, during strikes, in prisons. It’s because they are from the language of a redoutable adversary, the enemy of humanity who, for two centuries, has masterfully handled fear, force and propaganda. This deadly parasite, this social vampire, is capitalism! We are not this “community of destiny”, proud of its “identity”, full of national myths, which has not been able to resist social history. We are not French. We are not this mass of “small people” ready to close ranks with their masters as long as they are “well governed”. We are not the people. We are not this aggregate of individuals who owe their existence only to the recognition of the State and for its perpetuation. We are not citizens. We are the ones who are forced to sell their labour force to survive, those from whom the bourgeoisie makes most of its profits by dominating and exploiting them. We are the ones who are trampled, sacrificed and condemned by capital, in its survival strategy. We are this collective force that will abolish all social classes. We are the proletariat. • The yellow vest movement will be defeated if it persists in believing that the interests of workers are compatible with those of the bosses. This illusion is already producing damage because Macron is using it to turn the protest against the exploited. The poor capitalists – opportunely portrayed as poor capitalists: small entrepreneurs, craftsmen and other self-employed entrepreneurs – victims of social “costs”, would share the same fate as their employees. They should therefore be generally spared and we should merely demand charity from the richest and most powerful of them. This allows the Power to insult us while pretending to respond to the demands. The alleged increase in the minimum wage [“SMIC”] will only be paid by wage workers. The decision to cancel the increase in the “CSG” [“Generalised Social Contribution”] masks the maintenance of the reduction in retirement pensions for the poorest. • Based on this biased approach, a faction of yellow vests argues that a State spending less would reduce the tax burden on businesses, boosting economic activity and providing a win-win situation for everyone… This is a bad fairy tale. Because it is not the State that stifles small capitalists, but first and foremost the law of competition that makes them exist and thanks to which they can take market share, i.e. to develop. The social problem is thus wrongly presented by the movement so that the “badly governed State” is targeted instead of the capitalist system, and as a result the government’s programme to dismantle the “social welfare State” in the name of “optimizing public action” is consolidated. The social predation policies of removing the redistribution from the rich to the poor, hitherto carried out through social security and public services, are ironically strengthened. Similarly, measures to reduce the overall wage by reducing deferred wages (retirement, unemployment benefits, etc.) are therefore justified. It’s to make a rod for one’s own back. • In this context, which puts the emphasis on the economic balance as long as it is well managed, what is wrong with the economy comes only from the outside: the tax State, the European Union, the “cosmopolitan” “Finance” (and behind that, it is sometimes the “Jews” and the “illuminati” who are referred to), the immigrants. The misunderstanding or the refusal to admit this glaring truth that capitalism – as a system producing wealth from the exploitation of human labour – is in crisis, leaves ample space for reactionary forms of safeguarding the prevailing order. Ten years of far right activism on the Internet put a lot of pressure on this suicidal state of confusion in which many yellow vests believe they can see a solution to their suffering. • Among these “solutions”, the Citizens’ Initiative Referendum, promoted for a long time by the “fachosphère” [“extreme-right influence groups, mostly on internet and social networks”] and that ended up bringing together Mélenchon’s followers, is a hoax that allows the social question to be suppressed under an institutional grub. This democratic arrangement would not solve anything, even if it was adopted. It would just stretch the electoral elastic while maintaining the relation between social classes – its conditions as well as its stakes – with an extra strengthening of legal reformism, that poor relation of the already illusory economic reformism. It would be tantamount to a more direct endorsement of ordinary enslavement. • The yellow vest movement ends at the workplace gates, i.e. where the totalitarian rule of employers begins. This phenomenon is the result of various factors. Let’s remember three of them: 1) The atomization of production, which sees a large number of employees working in (very) small companies where closeness with the employer makes it very difficult to strike. 2) The social insecurity of a large proportion of employees, which seriously deteriorates their ability to deal with conflict in the workplace. 3) Exclusion and unemployment, which put many proletarians out of production. A large proportion of yellow vests are directly affected by at least one of these three determinations. • The other component of the wage-earners, the one that works in large corporations and has better job security (permanent contracts and status), seems to be cosseted, on which the powerful force of the movement breaks like the wave on the rock. A special treatment, consisting of managerial efficiency and shameful trade-union collaboration, is reserved for this segment of the working population. The bourgeoisie has understood that this category of workers has the power to strike at the very heart of capitalist production, through the indefinite general strike. This is why it consolidates pacification by giving lollipops in the form of “exceptional end-of-year bonuses”. • To recognize ourselves in the calls of the yellow vests of Alès, Commercy and Saint Nazaire, whose concern to refuse any hierarchical organization, any representation, and to target the capitalists, is for us the sign of the way to go. • To want to break the ideological, managerial and trade-union shackles keeping the yellow vest movement out of the production process. We must use the extraordinary as well as determined force developed by this movement to achieve what millions of exploited people have wanted for so many years, without ever having succeeded doing so: to paralyse production from inside, to decide on strikes and their coordination in general assemblies, to unite all categories of workers, with the same objective of overthrowing the capitalist system and re-appropriating the production apparatus. Let’s put an end to hierarchical, capitalist and State oppression. • To want to discuss right now on the strike, on its initiating, its extension and coordination. Contact us, Join us! This is an excellent statement. I only hope it achieves a response that helps the working class in France and internationally to multiply its struggle. True to their democratic/citizenry form, some of the organisers of the "gilets jaunes" are actively preparing for the European elections on May 26. Inevitably and predictably, the movement has splintered into more than several elements with those for and against participation (leader, co-founder and right-winger, Benjamin Cauchy against) and between the factions that are enrolling onto the electoral lists. There are three of the latter so far, with the latest that of Thierry Paul Valette, author, comedian and founder of "national equality" and organiser of demonstrations in Paris. Another faction is led by retired commercial director, Patrick Cribouw, active in the south in organising demonstrations and roundabout occupations. He's written about immigration and French sovereignty, denied he's close to Marine Le Pen, and has set up an electoral group called "union jaunes". He was one of the main figures responsible for the "list of demands" that, for some reason, the CWO seems to regard as a positive development. Meanwhile, in further signs of tension between France and Italy over the latter's populist government officials meeting pro-election standing Yellow-Vests, a whole diplomatic row has broken out. 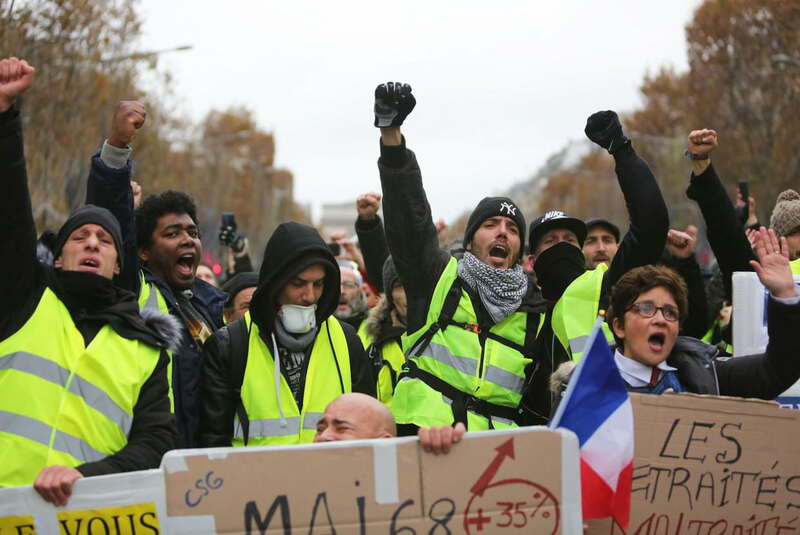 The populist Italian leaders met leaders of the "gilets jaunes" movement in Paris, including Cristophe Chalencon, blacksmith, racist and organiser of Yellow-Vest events in the Vaucluse region and Ingrid Levavesseur, an unemployed teaching assistant from rural northern France, who was active in social media organising and wants "to bring the roundabout challenge to Brussels". The meeting between these, others and the 5-star movement was, the latter said, in "total agreement". However, other Yellow-Vest leaders were not invited to the meeting including the right-wing Eric Drouet, Maxime Nicolle, conspiracy theorist, one of the first leaders and organisers of the movement and Priscilla Ludosky, businesswoman and one of the early main participants, along with Drouet, of social media organising. She later fell out with Drouet maybe over her meeting with government figures. All of this reactionary and motley crew, whether meeting the Italians or not, for European elections or not, are united in their concern for the citizens of France and the needs of French capital. Many of the roundabout "occupations" where, at best, workers are totally isolated, have been engineered, through social media, by right-wing elements and conspiracy theorists. At least some of the activity on these check points has been to let the right looking French faces through and stop "foreigners", a real launching pad for racialism and nationalism. But, there's been a breakthrough according to this week's Socialist Worker: "The movement took a massive step upwards (on Tuesday) by linking up with strikers..." The CGT and some other unions, including some of the schoolchildren, called some brief strikes, with a unity call with the Yellow-Vests. The CGT, for the first time, invited Yellow-Vests to join the Red-Vest (limited) strike. Fabrice Angei, Secretary of the CGT, said that despite differences the two sides could come together for "nationwide" issues. There were other workers joining actions of the Yellow-Vests in other parts of France. From what I saw they were mostly blockades and roundabout check points with the tricolores above them. The unions, like the left, have had to jump on the bandwagon but the idea that this movement can work together is delirious. There are major differences not only between the left and right wings, but within the Yellow-Vest movement itself. The only thing that is giving it any political cohesion is that it's against Macron, it's against the elite, it's populist. A French Ifop poll published in the Telegraph today showed that 46% of the Yellow-Vest movement thought that immigration was deliberately organised by an elite to replace Europeans. 62% believe that the pharma industry is covering up the harmful effects of vaccines; forty-four per cent believe that there's a planetry Zionist plot ("Juden" was daubed on a bagel shop in Paris' Jewish quarter during Act XIII) and 42% voted for Marine Le Pen. A majority of the organisers and leaders of the movement (see above) have openly expressed these views from the beginning. This is not to denounce workers who have been involved or sucked into this movement, no more than it is to denounce angry workers in the US for voting for Trump, nor angry workers in Britain for voting for Brexit. But these populist movements are extremely dangerous for the working class and particularly a working class that is in a present state of weakness.There is a need for the workers to break with this populist movement of the French citizenry. There is a need for proletarians (whether workers, housewives, students, unemployed, pensioners or lumpen) to break with the populist nationalist aspects of this movement, but not all of those involved nor all of the actions are simplistically "populist". E.g. the yellow vests in La Réunion launched a wave of riots back in November that lead to the imposition of a curfew in 15 towns there. In Saint-Denis, the Score supermarket in the Vauban district was vandalized. They then went to Vauban’s pharmacy. At the Cauldron, a fast-food restaurant was invaded by about thirty masked people. A major fire was ignited on the roundabout of this fast food place….Young people then gathered near the Simply Market store in La Providence. A crowd formed, garbage cans were burned to prevent traffic circulating. Then, the young people attacked the iron shutters of the Simply Market before entering inside and emptying the liquor section of the store….In Saint-André, there was a report of a fire being started at the annex of the town hall of Cambuston. In Saint-Gilles-les-Bains, two fires were set in Montroquefeuil and another in town towards the Score. In Saint-Paul, an SFR building and an Orange store were targeted. At the Port, the MacDonalds was burned and vandalized….and looted. Cars were also burned, especially in Saint-Denis….In the Vauban district in Saint-Denis, but also in Mufia, clashes took place between young people and the police from the start of the evening….The road was cut off by protesters at the intersection “Chemin Neuf”. The police intervened with tear gas to dislodge them. The helicopter of the gendarmerie was mobilized for a good part of the evening to fly over Saint-Denis.” In all, 8 towns (Saline les Bains, La Providence, La Possession, Saint-Benoit, Saint-Denis, Saint-Paul, Le Port and Saint-André) experienced riots on the island. Some obvious bad aspects of this have been gangs playing the state by forcing car owners to pay a “toll” to travel along certain roads. A curfew has been imposed on 14 towns. And the initial movement of high school students, at the end of November, against intensified selection to the universities, at the end of November, was catalysed by the yellow vests (see this in French: http://www.revolutionpermanente.fr/A-Tours-des-lyceens-mobilises-reprimes-violemment-par-les-forces-de-police ). Doubtless these events will be dismissed as not conforming to a vulgar marxist definition of proletarian struggle by the ouvrierist Baboon. Dogmatic black/ white thinking, though, is typical of this ICC fellow-traveller.